This is a Digital product. No physical item will be shipped. Instant download printable - digital collage sheets - beautiful vintage collage sheets full of elements, word art and papers for your crafting projects - altered art, glass cabochons, scrapbooking, ATC's, art journalling, jewellery, resin pendants, hang tags, rings, earrings, keyrings, magnets, stickers and all your needs for your art. Fits standard paper size 8.5" x 11" / A4 when printed. ♣ You CAN re-print our images as many times as you need. 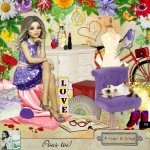 You can incorporate the images in your craft / art for personal and small commercial use, up to 150 times each item. ♣ The final product you sell, must be tangible (not digital) and made by you (not mass produced). ♣ You CANNOT sell printed papers of any kind, e.g watercolor paper or card-stock. 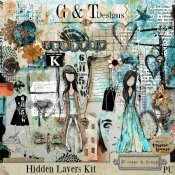 ♣ You CANNOT sell G&T Printable Designs images as a part of kit, e.g. for scrapbooking etc. ♣ You CANNOT share purchased files with other people, re-sale or give away our digital images. ♣ You CANNOT use our images or part of them in a digital form, e.g for websites, blogs, banners etc.